We talked about forgiveness in Sunday school last week. The paschal mystery invites us to experience newness of life, and releasing resentment in an act of forgiveness is one way to say “yes” to that invitation. A couple participants asked me for my presentation material and notes, so I thought it might be timely to recycle an old post on the 5 Steps to Forgiveness. I am looking for action verbs, here. Putting a name to the wrong done against me sets that action apart as unacceptable. It establishes a healthy boundary defining what is and isn’t ok with me. In the process of pinning down the exact action that upset me, however, I might realize the offense wasn’t so bad. Maybe hunger or fatigue exacerbated my response. Maybe my offender made a harmless remark that triggered a harmful memory. Realizing this gives me an opportunity to look deeper within for the true source of my resentment. It also allows me to release resentment for one who meant no harm. The key here is a simple, blame-free statement. “When you X, I feel Y.” Most things that upset me result less from malicious intent than people intent on their own agenda, oblivious to repercussions. Showing someone the unintended consequences of his actions creates the opportunity for genuine remorse. Even genuine remorse might not pry the lid off my resentment if I fear being hurt again. A candid conversation about how to prevent repeat performances can restore trust. Sometimes wrongdoers have good ideas for that. There’s no question that the absence of remorse makes forgiveness hard. The thing I do here is take the unremorseful offender out of the matter and focus on my side of the street instead. I take a cold hard look at how the wounds I received played a role in the wounds I inflicted, and I take responsibility for my impaired response. This is not victim blaming. It’s control claiming. Confronting my misdeeds leads to the realization that I stand in need of forgiveness, too. We act out our relationship with God in how we treat others. Recognizing how I treat God in the face of how God blesses me fills me with remorse and desire for renewal. When I can honestly say I care less about what my offender deserves than I care about restoring my relationship with God, I’m on the home stretch to forgiveness. It is the ultimate liberation to see forgiveness not as a response to what my offender deserves but as a response to God’s grace towards me! Join the conversation. Which step do you think is the hardest? Which helps the most? It wouldn’t be terribly helpful to ponder why forgiveness is hard without considering what exactly we can do to overcome the obstacles. It seems to me there is a lot written about the healing power of forgiveness but very little about how actually to do it. Here’s where spiritual conditioning can help us do the right thing, even when it’s difficult. These are the steps that help me. I am looking for specific action verbs, here. Putting a name to the wrong done against me sets that action apart as unacceptable. It establishes a healthy boundary defining what is and isn’t ok with me. In the process of pinning down the exact action that upset me, however, I might realize the offense wasn’t so bad. Maybe hunger or fatigue exacerbated my response. Maybe my offender made a harmless remark that triggered a harmful memory. Realizing this gives me an opportunity to look deeper within for the true source of my resentment. It also allows me to release resentment for one who meant no harm. There’s no question that the absence of remorse makes forgiveness hard. The thing I do here is take the unremorseful offender out of the matter and focus on my side of the street instead. I take a cold hard look at how the wounds I received played a role in the wounds I inflicted, and I take responsibility for my actions. This is not victim blaming. It’s control claiming. Confronting my misdeeds leads to the realization that I stand in need of forgiveness, too. I believe we act out our relationship with God in how we treat others. Recognizing how I treat God in the face of how God blesses me fills me with remorse and desire for renewal. When I can honestly say I care less about what my offender deserves than I care about restoring my relationship with God, I’m on the home stretch to forgiveness. Has anyone ever told you to “forgive and forget” or “just let it go”? They make forgiveness sound easy, as if it’s an automatic response to deciding forgiveness is in our own best interest. But releasing resentment in an act of forgiveness can be monstrously difficult, even when we genuinely want to leave old episodes in the past. It helps to see clearly what holds us back from the forgiveness we desire. Here are five things that make forgiveness hard. Sometimes what forgiveness is NOT poses obstacles to forgiveness. Forgiveness does not condone the offense, liberate anyone from consequences, or restore trust. Forgiveness does not compel anyone to forget anything, to tell anyone they’re forgiven, or to stay in relationship at all. If I’m laboring under the misconception that forgiveness requires any of these things, I might quite understandably find forgiveness impossible to do. Fortunately, forgiveness is simply the release of resentment and claim to retribution—no more and no less. It is possible to release resentment and then end a relationship or return to a different kind of relationship with less trust. Most of us expect a little recognition for good deeds and to be held accountable for our mistakes. When someone does us wrong, we want that person held accountable. It flows from our sense of justice. If our offender appears to be waltzing off scot free, with no one holding her to account for her wrongdoing, we naturally feel drawn to fill that void. Thus, our desire for justice and accountability can work against releasing resentment. Being the victim of someone’s harmful choices can have several consequences. It can really hurt of course, but being the victim can have subtle payoffs as well. Recognizing another’s moral failings can make us feel better about ourselves, or at least better than the moral flunky who did us wrong. In addition to feeling superior, we might feel entitled to something from that person. Our attachment to superiority or entitlement pulls us away from releasing resentment. In a badly tattered relationship, resentment may be the only thing left between two people. If it’s someone I think I need in my life, I may cling to the resentment because it’s all that’s left. This phenomenon sometimes plays out in parent relationships with adult children. A parent might cling to resentment for adolescent behavior as her only connection to a time when her child needed her. That desire for connection is at odds with releasing the past. The big kahuna of forgiveness obstacles is a lack of remorse. Genuine remorse on the part of our offender gives us a sense that forgiveness is complete. Without it, forgiveness feels one-sided and unfinished. Sometimes offender remorse is impossible, though. An addict deeply in denial, for example, doesn’t have the capacity for remorse. In the case of long past childhood wounds, the offender may have died. Even in stubborn cases without any offender remorse whatsoever, there are steps we can take to lead us to the healing power of forgiveness. Join the conversation. 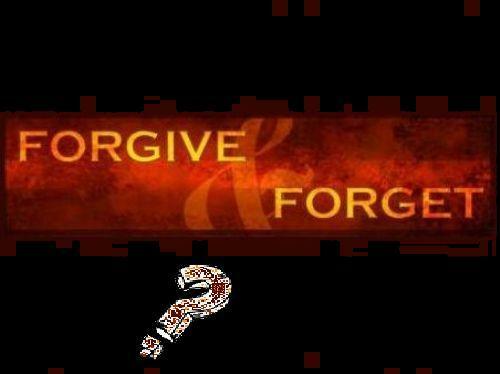 What has made forgiveness most difficult for you? Forgiveness is a two part process involving the offender’s genuine remorse for the offense and the victim’s release of resentment, but what happens when one part is missing? The last post considered a man’s painful struggle to put the past behind him and to release resentment in the absence of the offenders’ remorse. I met him in a reconciliation workshop, and in the same workshop I met a woman who had sought forgiveness with sincere remorse for hurtful things she said and did to her mother during adolescence. Her mother is now 92, and after almost 50 years, still withholds forgiveness. It pains the woman to know that her mother is unlikely ever to release that resentment, and she continues searching for something she can do to win her mother’s forgiveness. The Jewish tradition offers a particularly helpful framework for working through this situation. Teshuva is the name for the rabbinic concept of repentance necessary, but not sufficient, to receive forgiveness. It is a process for turning to God, mending relationships with others, and turning to one’s true self (the self one was created to become). Although a deeply personal process, teshuva nominally consists of five steps: recognizing our wrongs, feeling remorse for them, making restitution to those we harmed, confessing our wrongs to God, and above all, stopping the wrongdoing. The Jewish tradition recognizes degrees of teshuva. To stop sinning due to fear of human consequence is a lower degree of repentance than to stop sinning due to fear of divine consequences after death, which is yet a lower degree of repentance than to stop sinning due to a change of heart. To stop sinning because of love is the highest degree of repentance, but it is not required for forgiveness. The right actions are enough. It matters not whether someone is beset with indecision or steadfast if in the end he chooses right actions. The parable of the prodigal son is a great New Testament illustration. Did the son return to his father out of love, his hardship having led him to appreciate his father in a new way, or because he was hungry? It doesn’t matter. The salient point is that he turned. Once the steps are completed, there is a basis for forgiveness. It is sometimes said that one can only be certain that teshuva is complete if the offender chooses right actions when placed in a situation identical to that which led to his wrongdoing. However, sometimes the situation is impossible to recreate. A woman in her 60’s cannot go back to her teenage years to prove her repentance. Following this path may not make forgiveness complete, but it does give someone seeking healing hope for making peace with a painful past. Join the conversation. Have you been locked in conflict with someone clinging to resentment? “Forgive and forget” is a mantra from my childhood. I wasn’t particularly good at either but notably bad at the latter. Is forgetting part of the forgiveness process? What exactly constitutes forgiveness? A man I met in a reconciliation workshop had survived child abuse and the wreckage of several family members’ alcoholism. The depth of his 50-year struggle for forgiveness made an impression on me. In the struggle, it seems that what forgiveness is not can present as many obstacles as what forgiveness is. To forgive is to release resentment and claim to retribution. To be complete, forgiveness is a two part process involving the offender’s genuine remorse for the offense and the victim’s release of resentment. Forgiveness does not release the offender from accountability for her actions. It does not erase financial, legal, physical, emotional, or any other kind of consequences. Forgiveness does not make the offense permissible. To the contrary, naming the offense as worthy of forgiveness marks it as unacceptable. And forgiveness does not restore trust or repair the relationship. A relationship might not be repairable, with or without forgiveness. While restoring a relationship to full trust may be desirable, it is not always realistic. The good news is forgiveness is possible without it. Trust merits special consideration. While forgiving is the moral choice, restoring trust might not be. Should the parents of a child who has been molested by an uncle release anger and resentment for the uncle? Eventually, yes. Should the parents return to relationship with the uncle? Maybe. Should they trust the uncle? No. Evidence suggests molesters reoffend. Neither family ties nor religious belief require anyone to ignore evidence. Protecting a child is a parent’s moral obligation. In this case, the moral choice is to release resentment and, if the uncle has genuine remorse, to return to a different kind of relationship without trust. Note forgiving the uncle in this scenario would not absolve him of legal consequences for any crimes committed. Forgiveness can be a struggle if one of the two necessary parts is missing. This is true for the man in the reconciliation workshop. His alcoholic brother is in denial and lacks the capacity for remorse, and the father who abused him died. What can he do when there is no possibility of offender remorse? Even without genuine remorse, there is hope for healing. The hope starts with a journey inward–introspection. Taking an honest look at how the wounds we received played a role in the wounds we inflicted, and taking responsibility for the harm we caused others, is a step that is completely within our control. The very act of changing our wounded-wounding pattern severs the ropes that tie us to a wounded past. Once free, we can release resentment and pray for our offenders, dead or living, to receive grace. That does not make forgiveness complete, but it does create healing power. Join the conversation. How have you approached forgiveness when your offender lacked genuine remorse? When discussing what draws us towards healing, growth and renewal and what holds us back, shame claims a place in the conversation. For some, it’s not original sin thinking (“all people are inherently bad”) but shame (“I in particular am inherently bad”) that holds them back. My study group is blessed with a woman who has deep insights into how shame’s tentacles reach into seemingly unrelated parts of one’s life. “Childhood tapes” are what she calls the messages, for better or worse, deeply ingrained from one’s upbringing. Sometimes the tapes say that you’re not good enough, that you have to earn love, or that you will never do or be enough. The feeling of being bad—the person not the behavior—is shame. There’s a difference between shame and remorse. When we look back on past choices, we will feel proud of some of them. We will also change our mind about some of the choices we made. That’s what it is to repent—to rethink our choices and to change our minds about some of them. Once we see the moral weakness in our choices, it is natural to feel regret for them. We might feel a separation from God. We might even feel a separation from ourselves, or the self we desire to be. Remorse is a sign of hope because it signals a change of heart. It’s the very seed of life change, and God plants it. Healthy remorse says, “I made a bad choice,” rather than, “I am bad.” The latter inhibits healing in several ways. First, it implies my condition is static, and that is inaccurate. Popular Buddhist activist, author and monk Thich Nhat Han repeatedly expresses the idea that anything is possible as long as one is alive. When I say, “I made a bad choice,” I open myself to the other possibilities that were present. When I say, “I am bad,” I close myself off to them, both in the past and in the future. Second, when I tell the person I offended, “I am bad,” perhaps hoping for some form of protest, I am warning her to expect a repeat performance. “I made a bad choice,” accompanied by genuine remorse, gives the person I offended reason to hope for better in the future. Finally, whereas “I made a bad choice,” can lead to feelings of guilt and healthy remorse, “I am bad,” leads to feelings of shame. When we grow into a pattern of shame from childhood, the impulse that triggers shame may be wired to a deeply rooted survival impulse. Perhaps bowing down to “I am bad” statements was the only way to survive a parent’s wrath. Or maybe accepting blame was the path of least resistance. In either case, a child might develop a reflex—an unthinking habit rather than a thoughtful response—of shouldering wrongs that belong to another. When we realize shame is connected to a primal survival impulse, we can understand how it has the ability to reach into all aspects of life. Despite the deep hold shame can have on a psyche, it can be disconnected. It requires a thoughtful inventory of the impulses that trigger shame and mindfulness to replace unconscious habits with intentional responses. It will take effort. Ask for God’s help, and let him do the miracle of making it enough. Join the conversation. How do you re-wire childhood tapes from your past so that they no longer connect to your present?